Yaquta Kanchwala Fatehi is a program manager with the Performance Measurement team. She studies the impact of organizations and businesses operating in emerging economies on individuals from low-income households. With this data, she develops recommendations to scale positive impacts and reduce negative impacts, and help businesses with their decision-making. Previously, she was a consultant at Dalberg (Mumbai office) on variety of growth and sustainability projects, a project manager on a TechnoServe project in East Africa to improve non-emergency, household nutrition in Ethiopia, as an intern with UNDP-Kuwait focused on researching public private partnerships and as a research associate at Swadhaar Finserve Pvt. Ltd., an urban microfinance in Mumbai to improve back-office operations. She has also worked as a technology analyst at Goldman Sachs in New York. 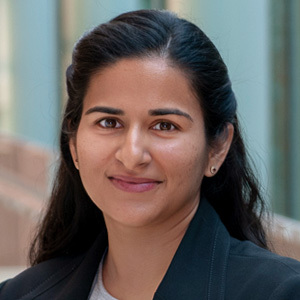 Fatehi holds a master’s degree in international affairs from Columbia University’s School of International and Public Affairs and a Bachelor’s degree in electrical engineering from Rutgers University.